To compete in the 2nd Philippine National Barista Championship, entrants must complete the online registration through the official competition website www.philippinenationalbaristachampionship.com. The first thirty (30) online registrants will get a slot at the preliminary rounds. The top six (6) scorers from the preliminary rounds will move to the finals and will vie for the most coveted Barista title of 2nd Philippine National Barista Champion. Resorts World Manila is the Exclusive Platinum Sponsor to the 2nd Philippine National Barista Championship. As of press time, other sponsors include Treston International College and Fly Ace Corporation (Gold Sponsors), Clear Water Systems Phils., Inc. and Philippine Barista & Coffee Academy(Silver Sponsors), and Kickstart Coffee and El Kapitan Food Enterprises (Bronze Sponsors). 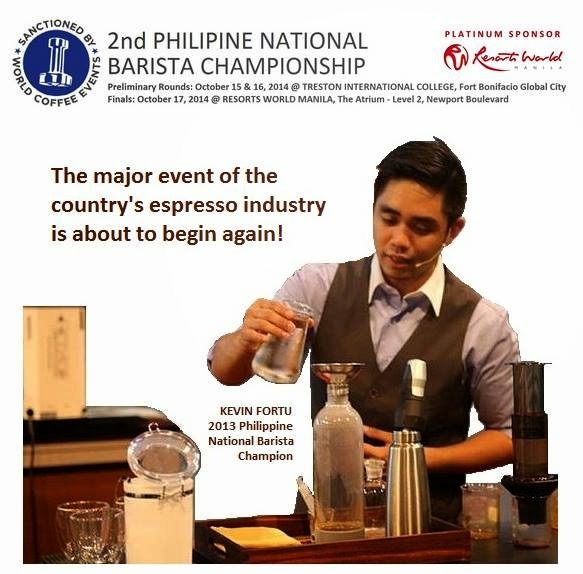 The grand winner of the 2014 competition will represent the Philippines to the 2015 World Barista Championship, April 9 to 12, 2015 at the Specialty Coffee Association of America (SCAA) Expo in Seattle, USA.